When the spine and posture are viewed from the side, the ear, shoulder, hip, knee and ankle should all be in alignment. To enable movement and absorption of forces whilst maintaining these positions in upright posture, the spine has natural side curves. In the neck (cervical spine) and lower back (lumbar spine) these curves are known as Lordosis, whilst in the mid-back (thoracic spine) the curve is called a Kyphosis. When these curves are increased the term “Hyper” is added to the start of them. The thoracic kyphosis should normally be measured with an angle of less than 40°. 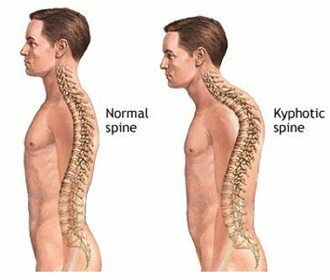 When the kyphosis is greater than 45°, the term hyperkyphosis is used and it results in the spine appearing more rounded than it should normally be. With gravity compressing us down hard at 9.8ms², our muscles have to work constantly to support our upright posture. When muscles are weak, it harder to resist this force and we tend to round our shoulders and jut our chin forward. The causes of hyperkyphosis are quite varied and depend on the time in life that they develop. They can be due to either postural factors, which means simply “poor posture” or they can be due to structural factors which involve an alteration to the shape of the thoracic vertebra causing them to become more wedged. Wedging of thoracic vertebra can be caused by congenital vertebra malformations from birth, Scheuermann’s disease in adolescence, osteoporotic fractures in adulthood, thoracic compression fractures due to trauma and spinal tumours and infections. Treatments for hyperkyphosis vary depending on the cause. In postural kyphosis, where there is no structural reason for the posture and the person can be positioned into the correct upright posture, a consistent postural strengthening and re-training will often suffice. In cases of Scheuermann’s disease where the deformity is progressing as the spine grows in adolescence, a Kyphobrace is often effective in improving the way the spine is growing when it is combined with a specific postural stretching strengthening programme. In adult patients who are becoming more hunched forward, a specific spinal rehabilitative programme involving Chiropractic Biophysics can be performed to help strengthen the postural muscles, learn awareness of correct posture and stretch or traction the spine back towards upright posture. In adults where pain and posture worsen when standing upright, a kyphobrace worn for periods throughout the day can help to ease discomfort and maintain upright posture. When non-surgical treatment is not effective in treating hyper-kyphosis. In cases of vertebral compression fractures, kyphoplasty may be performed, it involves an injection of a type of cement into vertebral body to stop further collapse. Surgery may also be performed to straighten the spine, but it is not without significant risks and complications.